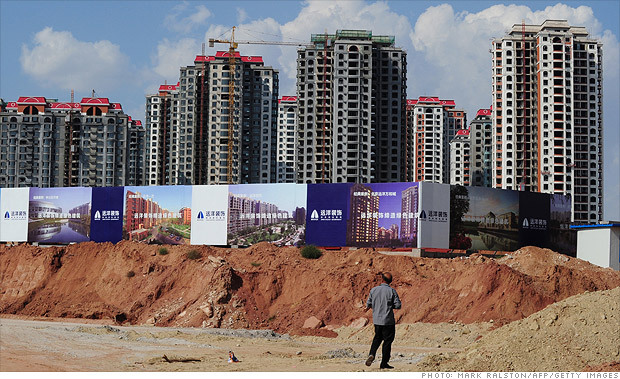 It's no secret that China's been on a building boom for years. So much so that construction now accounts for 70% of China's economic output, according to hedge fund manager James Chanos. The scary part is this: Chanos said that in recent months China's apartment sales are down 40%. Yet the construction continues. The city pictured above, Ordos in Inner Mongolia, is commonly referred to as the "Ghost Town" because no one lives there. We all saw what the real estate bubble did to the United States and Europe a few years back. What happens if it hits the world's second-largest economy? "Everybody gets affected by China's real estate bubble bursting," Chanos, a noted China bear, told CNNMoney earlier this year. ECB's Draghi: Euro breakup is "morbid speculation"
President of European Central Bank says euro is "irreversible" even though he sees tougher time for banks in coming year, and ECB talks of rising contagion risk.